Lefkada, the “mainland island” as characterized, belongs to the complex of the Ionian islands, called Eptanisa and is the fourth in row island with the largest extent. The distance from mainland Greece (Etoloakarnania) is only fifty (50) meters and the connection is made by a floating bridge. Together with renowned islands such as Scorpios, Meganisi, Madouri, Sparta, Kalamos, Skorpidi the Thulia, and Kythreas is a beautiful companion, an earthly paradise. Lefkada or according to Homer “white stone“, is birthplace of Aristotle Valaoritis Angelos Sikelianos of Lefkadio Horn and took its name from the Lefkatas cape located to the south of the island, where in ancient times was the temple of Apollo. The legend says that here on this cape muse Sappho end her life by falling from the cliffs into the sea. Cause was the unlucky and unfulfilled love of the beautiful Phaon, a sea demon, companion of Aphrodite. The island is full of olive trees, vines, cypresses, pines and other trees that reach the sea. The island is full of olive trees, vines, cypresses, pines and other trees that reach the sea. Perfectly combining both summer colors, blue and green. Breathtaking sea and mountain configurations and endless rugged coastline with beaches full of glittering pebbles, golden sand, deep blue and crystal clear turquoise waters. Famous beaches with distinct personalities as Kathisma, Egremni, Porto Katsiki, Pefkoulia, Millos and Gialos, recorded high on the list of favorite beaches at the Mediterranean, waiting for you to live unforgettable moments. Among the most important sights of Lefkada is the Castle of Santa Maura, founded in the 13th century by the ruler John Orsini. Compelling with fortifications which are standard in medieval times. The Monastery of Faneromeni is the most important monastery of the island. Founded around 1650, and thousands of pilgrims visit it every year to pray to the Virgin Faneromeni. Lefkada is a paradise for water sports. 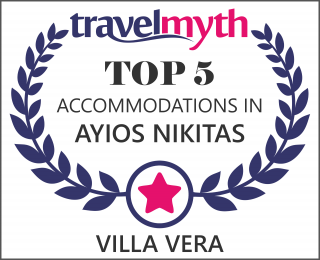 It is ideal for water skiing, sailing (gorgeous spectacle of sailing when they cross the channel), Windsurfing in Vassiliki, Kitesurfing on the beaches of Agios Ioannis and Milon and Paragliding over the magnificent beach kathisma. You can also go cycling, horse riding or walking in mountainous areas of the island. You can make day trips by boat to visit the nearby islands like Skorpios, Meganisi, Madouri and enrich your experiences and memories. Walk the cobbled streets, visit museums and historical buildings on the island, quench your thirst at springs with crystal clear waters, admire caves and waterfalls, try traditional specialties and buy Lefkadian embroidery and textiles, remarkable examples of traditional art. Lefkada is the hospitable people and their behavior makes you feel a friend, not just a passer. All these experiences really give another dimension to your holidays.